Parents, let us ask you this: what's more enjoyable than hiding the Easter egg hunt candy each spring? Filling the Easter eggs! Blair Candy has everything you need to have an epic Easter egg hunt this year. By that, we mean we have plenty of Easter egg candy filler that both children and adults will love. Here you can find all kinds of fun Easter candy in bulk, including pastel-colored Hershey's Kisses, foil-wrapped chocolate eggs, Jelly Belly jelly beans, Swedish Fish eggs, mini Reese's Peanut Butter Cups, and of course, Easter Hershey candy! You can get Hershey's assorted Easter candy mixes that include Reese's eggs, Kit Kats, Robin Eggs, and Cadbury mini eggs. Ah, Easter chocolate. Now that's sweet! Easter will soon be upon us! 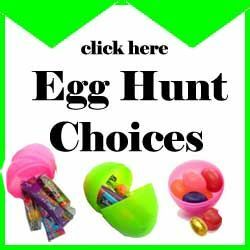 So be sure to order all of the wholesale Easter candy you're going to need for your organization or just for home. Don't forget: Easter egg hunts are more fun the more people are involved, so if you need a bunch of candy for this, Blair Candy's got the goods! Browse all our Easter candy today!